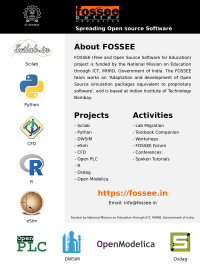 Details The FOSSEE team at IIT Bombay has taken up the initiative of promoting FOSS (Free and Open Source Software) for education. We organized a one day workshop on Oscad, a free and open source Electronic Design Automation (EDA) tool for breadboarding, circuit design, simulation and PCB design. Oscad has been developed at IIT Bombay. This workshop was beneficial for the students of Electrical, Electronics, Instrumentation, Communication, Information Technology, Computer Science and Engineering. The participants were provided with the Oscad software at the venue.